Nowy Sącz (Polish: pronounced [ˈnɔvɘ̟ˈsɔ̃ʈ͡ʂ]) is a city in the Lesser Poland Voivodeship of southern Poland. It is the district capital of Nowy Sącz County as a separate administrative unit. Founded by the Duke of Cracow on 8 November 1292, New Sacz (known also by other names) is one of the oldest cities in the Lesser Poland region, with a population of around 84,000 as of 2014. Nowy Sącz has been known in German as Neu Sandez and in Hungarian as Újszandec. The Rusyn (Galician) name was Novyj Sanc. Its Yiddish names include צאנז (Tsanz) and נײ-סאנץ (Nay-Sants). Other Polish noun forms: Nowego Sącza: “of Nowy Sącz”, w Nowym Sączu: “in Nowy Sącz”; adjective forms: nowosądeck-i/a/iego/iej/ie/ich and for the region sądeck-i/a/iego/iej/ie/ich. Nowy Sącz is located at the confluence of the Kamienica River and Dunajec, about 20 kilometres (12 miles) north of the Slovak border, in the Sądecka Valley (Kotlina Sądecka) at an altitude of 381 metres (1,250 feet). It is surrounded by ranges of the eastern Outer Western Carpathian Mountains: Beskid Sądecki to the south, Beskid Wyspowy to the west, Beskid Niski to the southeast, and the foothills of Pogórze Rożnowskie to the north. The geological basis is Carpathian flysch – an undifferentiated grey-banded sandstone – with alluvial sediment from the Dunajec, Poprad, and Kamienica rivers in the valley basin. The climate is temperate, with an average annual rainfall of about 700 millimetres (27.6 inches). Nowy Sącz is the governmental seat of powiat nowosądecki (county or governmental district) part of the Lesser Poland Voivodeship, Województwo Małopolskie since 1999. Between 1975 and 1998 it was the provincial seat of Nowy Sącz Voivodeship. Before that and during the Second Polish Republic, Nowy Sącz was a county seat in the Kraków Voivodeship. In 1951 it became a town with the rights of a county. It is the historic and tourist center of Sądecczyzna, the Sądecki district. Nowy Sącz was founded on 8 November 1292 by the Bohemian king Wenceslaus II, on the site of an earlier village named Kamienica. The foundation of New Sandec took place due to the efforts of Bishop of Cracow, Pawel z Przemankowa, who owned Kamienica. Upon request of the bishop, Wenceslaus II granted it Magdeburg rights, making it the only Polish town founded by the Bohemian king. Its name was taken from the nearby town of Stary Sącz. As early as 1329, the name was spelled Nowy Sandacz. In the 14th and 15th century Nowy Sącz emerged as one of the most important economic and cultural centers of this part of the Kingdom of Poland. The town benefited from its proximity on the trade route to Hungary due to privileges granted by King Władysław I the Elbow-high, and later his son, Casimir III the Great, for supporting him during the Rebellion of wojt Albert in 1311-1312. During these times, the majority of the town's inhabitants were German colonists. In the 15th century it produced steel and woolen products, and nearly rivaled Kraków in visual arts. In 1329, New Sandec signed a treaty with Kraków, upon which Kraków merchants, on their way to Hungary, had to stop at New Sandec; New Sandec merchants, on their way to Gdańsk, were obliged to stay at Kraków. In the mid-14th century, King Casimir the Great built a royal castle here and surrounded the town with a defensive wall. Nowy Sącz was the seat of a castellan and a starosta, becoming an important point in the system of defense of southern border of Poland. The town was further elevated in 1448 when Bishop Zbigniew Oleśnicki promoted a local church to the status of a Collegiate. Nowy Sącz prospered in the Polish Golden Age (16th century). It was an important center of the Protestant Reformation. Local leader of the Polish Brethren, Stanisław Farnowski, was very popular among local nobility. Good times ended in the 17th century. In 1611 a great fire destroyed much of the town, and during the Swedish invasion of Poland, the town was captured by the Swedes (late 1655), who burned and looted it. Nowy Sącz was a center of the rebellion against the invaders. The decline of the town continued in the 18th century, when Nowy Sącz suffered more destruction during the Great Northern War and the Bar Confederation, when the castle was burned. In 1772, during the Partitions of Poland, the town was annexed by the Habsburg Empire as part of Galicia, where it remained until November 1918. Nowy Sącz rose to a new prominence in the 19th century when the Austrian authorities built a railway connecting it with Vienna (1880s). New Sandec was the seat of a county, new buildings were opened, the town was a rail hub with a large rail repair shop opened in 1876. On April 17, 1894, the central part of Nowy Sącz burned in a fire, with a town hall and ancient town records. At that time, the town was important in Hasidic Jewish history for the founding of the Sanz Hasidic dynasty during the 19th century, the precursor to the Bobov dynasty founded in nearby Bobowa (with a synagogue with occasional services by Cracow congregation) and the Klausenberg dynasty. At the beginning of World War I, Nowy Sącz was occupied by the Russian Army. The Russians were driven back by the Central powers in December 1914. Briefly after the end of the war, it was associated with the short-lived independent Lemko Rusyn People's Republic, established by members of the Lemko (a subgroup of ethnic Rusyns native to the Beskid Niski). The inter-war Poland saw industrial expansion and the railroad factory expanded. In 1936, the Museum of Sandec Land was opened in the restored royal castle, and in 1939, the population of New Sandec was 34,000. During the invasion of Poland starting World War II, Nowy Sącz was occupied by Nazi Germany on 6 September 1939. Because of its proximity to Slovakia, it lay on a major route for resistance fighters of the Polish Home Army. The Gestapo was active in capturing those trying to cross the border, including the murder of several Polish pilots. In June 1940, the resistance rescued Jan Karski from a hospital there, and a year later 32 people were shot in reprisal for the escape; several others were sent to concentration camps. The regional Jewish community numbered about 25,000 before World War II, and nearly a third of the town's population was Jewish; ninety percent of them died or did not return. The Nowy Sącz Ghetto for around 20,000 Jewish people was established by the German authorities near the castle. Its inhabitants were deported aboard Holocaust trains to Belzec extermination camp over three days in August 1942 and murdered. Across the river in the Jewish Cemetery, 300-500 Polish people were executed for their participation in the sheltering of Jews. The Red Army fought its way into the city on 20 January 1945. At war’s end, about 60% of the city had been destroyed. Nowy Sącz was honored for its heroism with the Cross of Grunwald, third class in 1946. 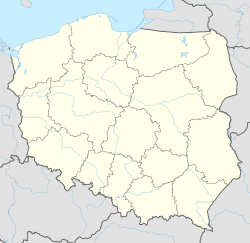 In 1947 much of the Lemko population, living in villages southeast of the town, was deported in Action Vistula (mostly to land recently annexed from Germany) in reaction to the nationalist Ukrainian activity in the region. During the Polish communist regime, Nowy Sącz was the capital of Nowy Sącz Voivodeship (1975–98). In the 1950s the Polish authorities applied a special economic programme for the town, called the Nowy Sacz Experiment. The plan was to provide improvement and acceleration of the region's economic development, but it was only partially completed. The town was an important centre of the railway industry, and now contains one of the biggest railway engineering works in Poland. Since the social and political changes in Poland that started in 1989, the industry has faced economic problems. Nowy Sącz is also important in the food industry, specializing in processing fruits, especially apples. Most of the factories were in the Biegonice district. Now the local government is trying change the structure of the industry, restructuring old factories and encouraging new companies to start up. This initiative also includes a move to hi-tech industry. Nowy Sącz had one of the first computer companies in Poland, with the largest assembly plant in Europe, but this has closed due to ownership friction with the government. The building trade is also represented in the town, which has a major European window-manufacturer. Like all the bigger towns in Lesser Poland, it has seen a significant influx of the largest European grocery chains. A main economic problem now is the high level of unemployment which, officially about 20%, is one of the highest in the European Union. Recently the local government has tried to address the persistent economic and social problems of the local Romani community, including access to utilities and education. The Great Synagogue, dating from 1746, now the Galeria Dawna Synagoga, a gallery with some historical displays. There is a memorial tablet on the front in Polish, Hebrew, and Yiddish. Across the Kamienica River is the Jewish cemetery. Saint Roch, a church of wooden construction from the 15th century, in the Dąbrówka district. The old cemetery chapel St. Helen's Church is another example. The partially restored ruins of a mediæval Royal Castle from the 14th century during the reign of Kazimierz the Great. It was destroyed in 1945 at the end of World War II when it was used as a German ammunition store and was the site of mass executions. There are also the remains of the city walls nearby. An open-air museum or skansen (Sądecki Park Etnograficzny), containing a village of relocated authentic structures recreating indigenous architecture, customs, and folk culture from the region. Of particular note are the wooden churches, including an Orthodox church and the Roma (Gypsy) village. Stary Sącz (Old Sącz) 10 km (6 mi) to the south, founded in 1163 but smaller than Nowy (New) Sącz, has a charming cobbled market square, with a convent of Poor Clares to the east. There are also several routes emphasizing wooden churches in the region of note. The mountainous country around Nowy Sącz is also popular with tourists, hikers and skiers, especially the Beskid Sądecki mountains (part of the Carpathians), of which the highest peak is Radziejowa (1,262 m (4,140.42 ft) above sea level). Nearby popular mountain resorts include Krynica-Zdrój and Piwniczna-Zdrój ("Zdrój" means "health spa"). 15 km (9 mi) north of Nowy Sącz is Lake Rożnów (Jezioro Rożnowskie), a reservoir (22 km (14 mi) long, covering an area of 16 km2 (6 sq mi), and a capacity of 193,000,000 m³), with many dachas and camping sites. To the north of the lake is the Ciężkowice-Rożnów Landscape Park (Park Ciężkowicko-Rożnowski). An annual festival of dance featuring children from highland regions from around the world takes place in July. Wyższa Szkoła Biznesu - National-Louis University — a business college with a strong emphasis on English. It has American accreditation. ZSEM "Elektryk" Technikum nr 7, Technical Secondary School of Electronics and Mechatronics. Best school of that type in whole Poland in 2014 by Educational Foundation "Perspektywy" ratings. Wikimedia Commons has media related to Nowy Sącz. ^ ORNAK. "Dia-pozytyw: Ślady i Judaica". Diapozytyw.pl. Retrieved 2009-05-06. ^ "Article on awards giving [PL]"
^ a b c d e f g h i j k l m n o p q r s t u v w "Miasta partnerskie i zaprzyjaźnione Nowego Sącza". Urząd Miasta Nowego Sącza (in Polish). Retrieved 13 March 2018. ^ "Netanya - Twin Cities". Netanya Municipality. Archived from the original on 2013-02-01. Retrieved 2013-08-01. ^ "Twin Towns". gabrovo.bg. Archived from the original on 2 August 2014. Retrieved 27 April 2014.